Good Meatless Monday morning Boothers! Today's meatless recipe for Swiss Chard Gnocchi in Tomato Cream Sauce comes to you from EnviRambo and her Midnight Maniac blog (which, if you haven't checked out, is fabulous). I love gnocchi, but I've always heard people talk about how hard it is to make, so I've never even bothered to try it. Color me inspired though - this is going on my list of things to try! I need to add some more sophisticated recipes to my repertoire. I cook from scratch just about every night, yet the recipes I make are still relatively fast and easy. I just don't have the patience, time, or skill for the more time-consuming, intricate recipes. I guess I like the idea of making all of our meals, I just don't actually like to cook. What kind of cook are you? Do you enjoy cooking? Or do you go for fast and easy like me? My friends will all tell you that I like to cook. The reality is that it's not so much the cooking, but that I like to feed people. There's just something about watching a loved one enjoy a well-prepared meal. Like Country Girl, I enjoy cooking for loved ones. Most of the time we opt for simple meals prepared with the freshest organic ingredients we can get. Big dinners are a thing of the past. They left us feeling bloated, lackluster and too often tossing and turning all night with indigestion. We go more for one-dish meals with a side of fresh cabbage wedges, broccoli florets, or sliced fruit. We tend toward the 30-minute meals style of cooking. Sure, we give up a little al dente in our noodles and rice sometimes, because we prepare enough to lay by for the next meal, but we make up for it with freshly stir-fried veggies and quick homemade sauces, which are the main ingredients and pack the biggest flavor/texture whollops. Looking forward to seeing how your other readers respond to this question. I have enjoyed cooking in the past. Now it's all about what can I toss together, b/c my schedule is insane. I try to make what I eat Weight Watchers friendly, too, as I don't want to regain an ounce. Meatless Mondays helps (I've got another salad recipe today). Homemade gnocchi is worth the time investment. My favorite is butternut squash gnocchi, but swiss chard gnocchi sounds intriguing and delicious! I enjoy cooking, when it's fast and easy. I prefer to make one pot meals, because well I don't have a lot of pots, but more so I don't like all the clean up. Most of my dishes are sauce based like this one. I find comfort in knowing that with a little butter, flour, and some type of liquid I can make a meal in minutes. And they're always different. With a basic bechamel in your arsenal the possibilities are endless. Throw in some veggies, serve over noodles, rice or biscuits and your done! I like fast and easy, but I also enjoy the rare evenings when I can just cook. My favorite meal is making Chinese from scratch - a 2-hour process that's well worth it! 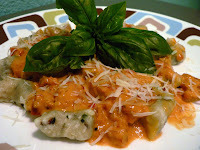 Tried EnviRambo's tomato cream sauce tonight (no time for the gnocchi though). Yum! Make us better - Take our survey! Clutter: The cost of conservation? Balance in a family crisis: Is it possible? Stop and smell the... strawberries!